Commander Chris Hadfield, the first Canadian Commander of the International Space Station sits in a Russian field after a fiery re-entry through Earth’s atmosphere. It will take approximately two weeks before Commander Hadfield can stand on his own feet after his lengthy 5 month space mission. All returning astronauts experience severe fainting when attempting to stand up since their bodies have adapted to the zero gravity aboard the International Space Station. Blood rushes away from their heads in uncontrolled syncope, what the scientists call orthostatic hypotension. What happens to our human ability to orient to the gravity vector on our Earth when you are an astronaut, where does the balance go when gravity orientation disappears? As I have stated before look again at Commander Hadfield’s face, he looks very fatigued from his ordeal, he looks like he has a concussion, which is what space flight appears to mimic. So as Commander Hadfield readapts back to the gravity he originally left what does it tell us about how the body organizes all its resources to live in its one gravity force field? I am going to outline a little understood pacing within the very oldest part of Commander Hadfield’s brain, the part that is called the reptilian brain. This is where you begin to look for what his gravity readaptation is located within his anatomy, the most important driving orientation to gravity. The start is within his vestibular system including the internal accelerometers comprising the utricules and the saccules structures on each side that sense Commander Hadfield’s head position within the gravity vector. One of the parameters that is measured in an astronaut that has returned to Earth is the blood pressure pulse. Essentially for Commander Hadfield, changing from a horizontal position to a vertical position is a control sequence of fluids maintaining their capacity to stay in the upper part of the human body. A freshly returned, to one gravity force, astronaut does not have the lower body muscle tightening capacity to maintain both fluids and circulating blood in the upper body regions. This gravity based reflex is lost from exposure to micro gravity from 5 months gravity free-living in the International Space Station. Where do these gravity based signals originate to control body fluid regulation? These signals originate within the vestibular apparatus to coordinate the heart pumping to maintain adequate perfusion, but travelling in space is equivalent to experience a hyperaging of a variety of physiological processes. The bones of Commander Chris Hadfield aged as if he were in his late sixties. His blood vessels got stiffer. His eyes changed shape, losing their roundness, flattening out in the back, creating tension onto the nerves at the back of the eyes. His leg muscles atrophied. His heart pacing changed subtly. But actually measuring his blood pulse is not as simple as one would expect. Think of the human pulse as a series of waves together converging onto a beach. You watch the crests sweep onto the sand before you, but what drives the waves to form, what determines their character their true character their height the distance between successive waves ? Waves contain harmonics that ride in step and also interfere with each other within a series. Some waves have very long peaks that are mixed in with shorter peaks, how do you make sense in all this mixing and merging ? That is exactly what researchers are beginning to probe. One of the earliest investigators was a German who in 1876 described the influence of what became to be known as Mayer waves. ( Mayer, Siegfried 1877 Studien zur physiologie des herzens und der blutgefasse. V. Uber spontane blutdruckschwankungen. Sitzungsberichte Kaiserlich Akad Wissenschaft Mathemat-Naturwissenschaft Classe 74:281-307) The waves running into the shore of Hadfield’s heart hold patterns from both chambers of his pumping heart, from his lungs with their waves of inspiration and expiration and the especially long waves, the gravity waves that both hold fluids within his body and cycle these fluids back upwards to return again and again in the tides that pulse to the rhythm of the gravity defining our planet. All of these patterns are seen in the pulse of Hadfield’s beating heart. But it is the gravity pulse that is trying to reestablish itself in the cluster of rhymes that will determine when Commander Hadfield can rise onto the surface not to stumble back into his chair as blood drains rapidly from his brain. “Mayer waves can be defined as arterial blood pressure (AP) oscillations at frequencies slower than respiratory frequency and which show the strongest, significant coherence (strength of linear coupling between fluctuations of two variables in the frequency domain) with efferent sympathetic nervous activity (SNA). In humans, AP oscillations which meet these properties have a characteristic frequency of aprox. 0.1Hz; 0.3Hz in rabbits and 0.4Hz in rats. The hemodynamic basis of Mayer waves are oscillations of the sympathetic vasomotor tone of arterial blood vessels, because Mayer waves are abolished or at least strongly attenuated by pharmacological blockade of alpha-adrenoreceptors. Within a given biological species, their frequency is fairly stable; in humans it has been shown that this frequency does not depend on gender, age or posture. It has been suggested that Mayer waves trigger the liberation of endothelium-derived nitric oxide (NO) by cyclic changes of vascular shear stress which could be beneficial to end organ functioning. The human body has a center of gravity during upright standing. Magically as we sway gently back and forth in our normal one gravity we sway as if to a very slow metronome with approximately 60 second rhythm if this postural body sway is measured by sensitive balance plate stabilometry as one of the indicators of equilibrium function according to Inamura’s group at Nagoya University of Japan in 1984. Inamura named this cyclic body sway, ‘one-minute rhythm’ as a one minute oscillation in postural sway. I find this cyclic body sway too technical it’s a gravity based body sway, I’ll call it temporarily, the Einstein Body Sway, which has more humanity to this gravity description for the sake of this essay. I would venture that Commander Hadfield’s Einstein Body Sway was considerably more erratic, less fine tuned, faster especially different after his five month space flight if compared to his preflight Einstein Body Sway. But measuring body sway oscillation before and after space flight is not something currently measured by the Canadian Space Agency nor NASA nor the Russian Space Agency. Let’s examine why the human body sways as if in beat to the pulse of gravity. Take a look at Commander Hadfield’s face again doesn’t it look older than just five months compared to the following picture. From his pre flight picture take a good look at the just landed picture of Commander Hadfield’s face compared to the extra lines beneath his eyes, his forehead creases especially with the frown lines diving deeper down each side of his mouth. All of these extra facial features are evidence of hyper aging occurring. It is said that the face reflects the brain that the face is the brain in its moment of health. As we age our faces age as a sign of the inner brain health. Commander Hadfield’s face at landing looks much older than five months when compared to his cleaner pre flight face picture. 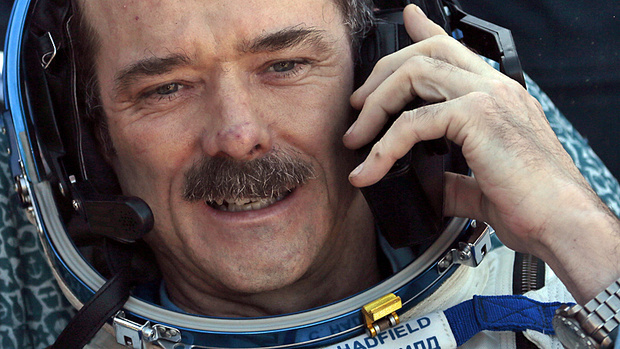 Something serious has happened inside Commander Hadfield’s brain by not having gravity to equilibrate his body rhythms for five months, it’s written all over his face. But why would humans sway in the first place to a 60 second rhythm ? The human body needs to maintain blood distribution throughout the human body in concert with the omnipresence of a gravity force always acting down. Our body sway is linked to our cardiovascular cycle to provide this equilibrium toward maintaining blood distribution throughout the entire body’s length. Not only is the cardiac cycle synced to the body sway so too is it to our breathing rhythm. As we stand in a one gravity force our body sways to communicate with our heart’s pacing coordinating with each breath to maintain blood pressure as fluids shift downwards when we attempt to stand from either a sitting or lying horizontal position. The one minute rhythm is also found in segmented body compartments as if our bodies were stacked sections one on top of each other from ankles all the way to our head in segments of division. ” When a human body takes an upright standing posture, venous blood is pooled in the lower part of the body due to gravity. Since one-minute rhythms were found not only in the postural sway but also in the cardiovascular variables, we have postulated that the one-minute oscillation in postural sway and the one-minute waves in the body fluid volume change in an upright standing position (will) contribute to maintain cardiovascular homeostasis.” (sourced from One-minute wave in body fluid volume change enhanced by postural sway during upright standing by Inamura, Kinasaku, Tadaaki, Satoshi Iwase, Yoshimitsu Amagashi and Sadako Inamura J. Appl. Physiol. 81(1): 459-469, 1996) Take away gravity and what do the astronauts notice most in space flight? They all report pooling of fluids around their upper body especially the head regions all getting puffy and bloated. The brain can’t sway itself when there is no down direction to sway to. Einstein taught us that to sense gravity you need to be accelerating at the same rate as on Earth when gravity is absent, that acceleration is first felt inside our brian’s own accelerometers, within the succule and utricule apparatus. When no acceleration is sensed our brain reacts instantaneously to compensate. Our sense of gravity when taken away is like a blow to the head, the sense of direction is lost. Our pacing through our eyes through our cardiovascular system through our bones begins to act as if the clock of time passing has snapped a mainspring, it’s as if our internal time ticking goes onto a logarithmic pace. This is the effect of hyper fast aging that flying weightless for 5 months does to the body of Col. Chris Hadfield. Raffi Kuyumjian, the Canadian Space Agency’s chief medical officer and Hadfield’s flight surgeon, described some of the temporary problems Hadfield is dealing with as he readjusts to gravity. They include shuffling his feet when he walks, soreness in his back, difficulty walking around corners and sometimes even bumping into corners. The physician said in a statement that his patient feels dizzy and finds it challenging to walk up or down stairs. Also, his manual dexterity is a bit off. “Although he does not feel it, his hip and back bones are not as dense as before his flight since they lost calcium in weightlessness.” That sounds like a person suffering from a brain concussion, no? I’ll leave with one final picture I found yesterday on how the bones of our face shift with aging. 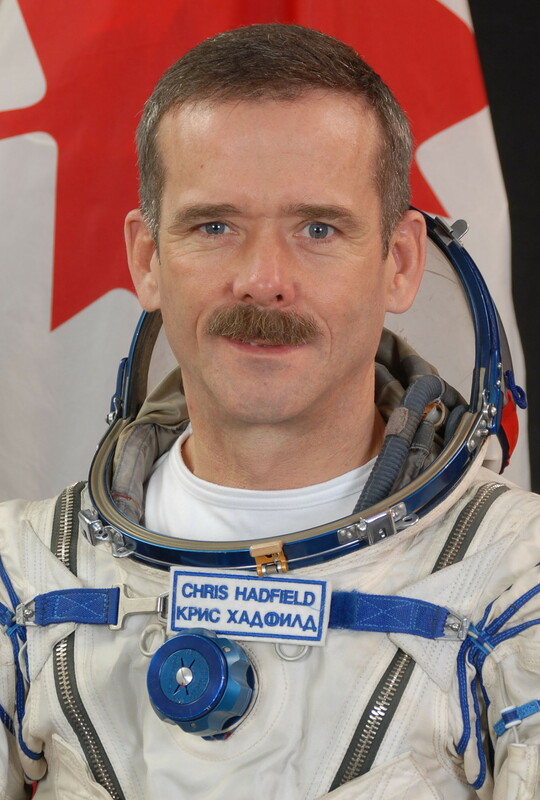 So if Col. Chris Hadfield looks haggard on that first photo I contemplate another of the quotes from his great observations along the lines, ” If we didn’t do all that exercise aboard the space station our bodies would age 50 years in the 5 months aboard.” Sometimes we speak of the mask of the face. But it is so much richer than that, our faces reflect our brain. Our face is our brain in terms of its state of health. Gravity is very much necessary for our brain to function properly. Take away the gravity vector imperils the aging process toward accelerating the very absorption of bones within the face. What Col. Chris Hadfield has courageously reveled with his 5 months in space is the rapid aging effects that swept into his body while he floated, untethered above the Earth. This amazing picture of the bone erosion is what happens to the human face as the decades slide by. The paper is from Aesth Plast Surg (2012) 36:753-760 entitled Changes in the Facial Skelton With Aging: Implications and Clinical Applications in Facial Rejuvenation authored by Bryan Mendelson and Chi-Ho Wong. Space travel is a huge accelerant onto the aging process of the human body. Col. Chris Hadfield has revealed the very bones of his face to expose them to this accelerated aging metabolic effect as if he had entered a time travel machine, acting as if his 5 months aboard the International Space Station were compressed into adding 5 years effects onto his face. 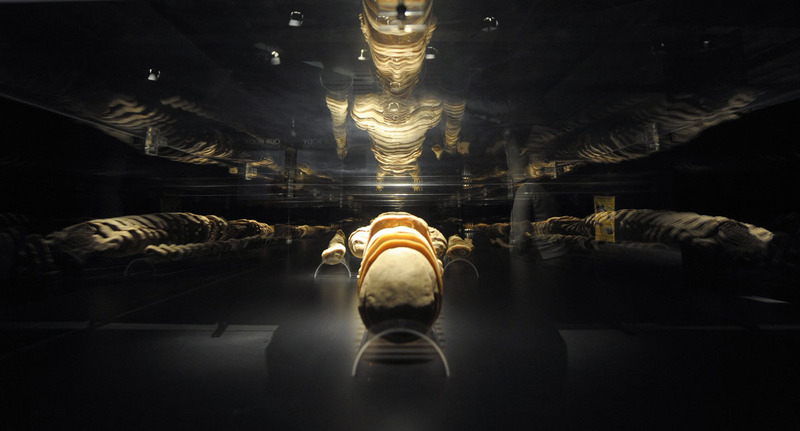 The bone lens focuses onto the processes within his brain into the shifting skeleton of his face. We learn from his courage that to understand something as soft as the brain you have to understand first the hardest substance of the body, the bones, to grab the significance that gravity has for making everything function. It’s as if we are eavesdropping between the conversation of the brain signalling witnessing bone strength density fading away during the absence of gravity. But how actually does the human face age, is it just sagging and dropping or is there more? The aging facial skeleton is actually rotating around the eyes as reported by authors Michael J. Richard, Carrie Morris, Byron F Deen, linda gray and Julie A. Woodward all working at the Duke University Medical Center in Durham, North Carolina. In their 2009 report in Opthal Plast Reconstr Surg Vol. 25, No 5 titled Analysis of the Anatomic Changes of the Aging Facial Skeleton Using Computer-Assisted Tomography. It is a general concept that once adulthood is achieved the growth of the face stops. Amazingly the earliest observation that the adult face continues to change relative positions throughout life was made in 1858 by Humphrey in his Treatise on the Human Skeleton. Pessa, another observer, formulated a face moving algorithm termed the Lambros Algorithm as the ideas of Enlow came to be studied concerning growth fields as descriptors of how the facial bones matured using the concept of motion drift among the bone segments making up the face during the sixties. 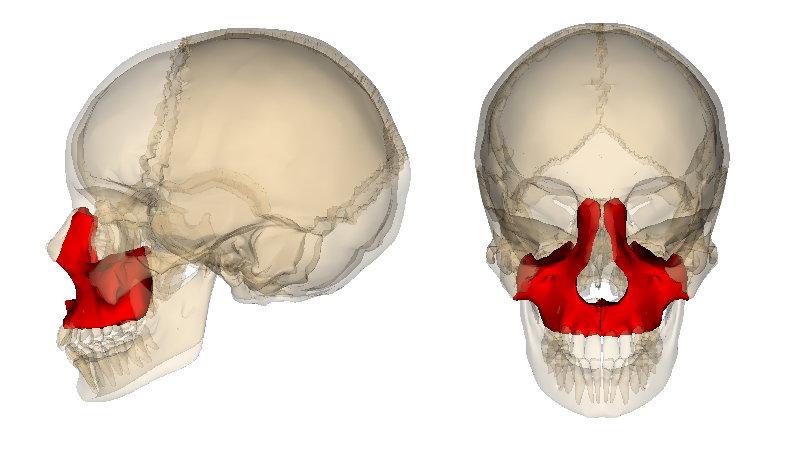 ” The Lambros hypothesis states that the bones of the facial skeleton rotate clockwise around the eye-opening, the orbit, when the face is viewed from the right side. 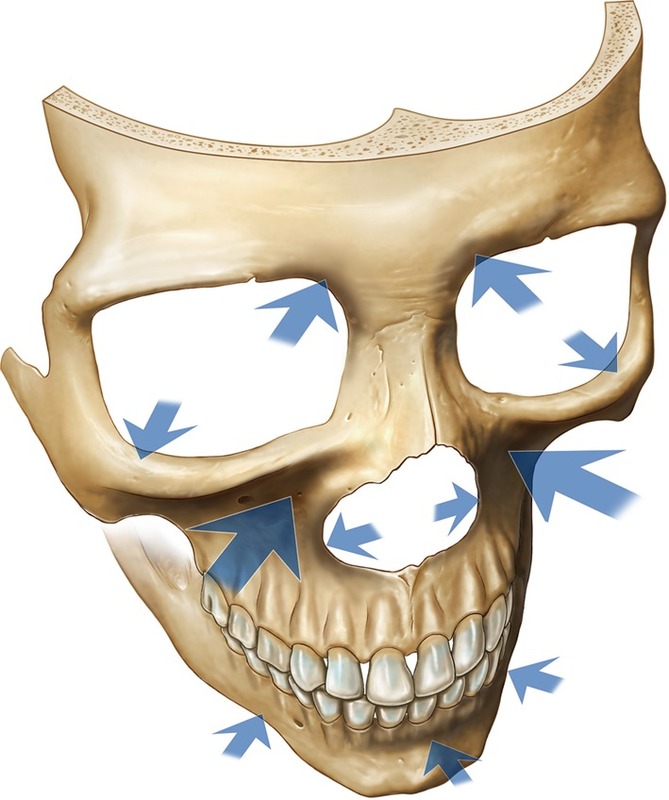 ” The forehead if viewed in a time-lapse speed up of time would reveal the changing drift of the bones as a motion field centered around the eye-opening rotating forward, anteriorly, but also descending slightly, inferior, while at the same time the midface rotates toward the back of the skull, a posterior direction and rising at the same time, inferior, as if following the curve of a circle. Essentially what these authors are saying is that as facial bones drift in a circular pattern causing the soft tissue to loosen its support which in regular observations describes the tissue sagging and descending over time as the facial muscles and ligaments also progressively become looser. So when we look at Col Chris Hadfield’s face we know there has been general body bone loss throughout the entire 5 months aboard the international Space Station. We would expect perhaps this bone loss to be at his hips or on his legs but not involving his facial bones which are not commonly thought to be affected by lengthy stays in space without gravity. The human face is not a mask something static as if painted on each day to show the world our emotional range of expressions. The very bones underneath are drifting in a tight choreography of elegant motion that are only now becoming apparent. As we age the face rotates into old age with a tension drop seen in the soft tissues of the face. The loss of gravity is a huge change affecting the central mechanism of general bone metabolism. So when we look at the landing picture of Col Chris Hadfield’s jubilant face we are seeing the effects of gravity on his face bones smiling, beaming back at all of his admirers here on Earth.